I have the well-earned reputation of being the finest sheep herding dog in the world. 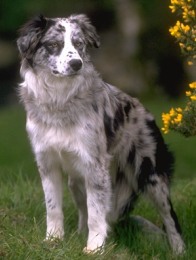 Standardizing my appearance has not been as important to breeders as maintaining and improving my herding abilities, so some border collies have longer hair than others and our colors vary. All borders use a �staring' technique when herding, controlling the sheep with an intense gaze along with strategic, timely movements. I have a lot of energy and need a lot of room and time to exercise, so city apartment life is not my thing. I am happiest doing what I do best � herding. When fully grown, I am between 18 and 21 inches tall (45.7 to 53.3 centimeters) and I weigh between 35 and 55 pounds (15.8 to 24.8 kilograms). We have no Border Collie Breeders listed at this time. Click here to place your Border Collie Ad!